Pedro Gil, Paris, circa 1900, and by descent to the present owner. M. Legendre and A. Hartmann, El Greco, Paris, 1937, fig. 178, as El Greco. H.E. Wethey, El Greco and his School, Princeton, New Jersey, 1962, II, p. 174, no. X-40, as unknown location and a copy, circa 1650, an opinion subsequently revised on first-hand inspection to 'Workshop of El Greco' (letter 30 August 1970). J. Camón Aznar, Domenico Greco, Madrid, 1970, fig. 244, as El Greco. Christ carrying the Cross was one of El Greco's most popular compositions. Wethey lists eleven variations of the theme, as partly or wholly by El Greco, and ten, including the present picture (a view subsequently revised, for which see literature, above), as by followers, imitators and copyists. Legendre and Hartmann (loc. cit. ), were followed by Camón Aznar (loc. cit.) in accepting the autograph status of the present picture. More recently Dr. Professor Alfonso Pérez Sánchez, having seen the original picture (private communication, 2001), believes that the head is fully by El Greco and the rest of the picture the work of his studio. Following a recent cleaning in which a signature in the form of the artist's initials reappeared at the foot of the cross, Dr. William Jordan, who previously rejected the work (private communication, 1998), has revised his opinion and now accepts the work as largely autograph on the basis of a transparency (private communication 10 April 2002). Dr. Jordan notes that there are significant differences between the present work and Wethey's 'Type I' composition and that the slightly less elongated proportions of this work also distinguish it from this type (see H.E. Wethey, El Greco and His School, 1962, II, p. 38, where dated to circa 1585-90). These differences, which do not appear to recur in other versions, can be seen mostly in the drapery. For example, the blue mantle and red tunic over Christ's left shoulder are significantly wider in the present painting, and the treatment of the folds of the blue drapery along his wrists is entirely different. Furthermore, there is a major difference in the position of the middle fingers of Christ's right hand that holds the cross. The two middle fingers seem to curl around the edge of the cross, rather than extend straight out, as they do in all the other versions of the composition. As Jonathan Brown has noted (The Robert Lehman Collection, East Greenwich, 1998, pp. 172-3) this composition type, which is common in North Italian painting of the late-fifteenth and sixteenth centuries, appears to have been introduced into Spain through the work of Sebastiano del Piombo. His narrative version of the subject (Prado, Madrid) and the reduced devotional picture (Hermitage, St. Petersburg) are both first recorded in Spanish collections. The latter was commissioned by Fernando de Silva, conde de Cifuentes, and completed in 1537. Both it and the picture in Madrid were described in the Escorial in 1626 by Cassiano dal Pozzo, who mentioned that the reduced version was 'especially dear to Philip II' (loc. cit.). That the composition was well-known in Spain is attested to by the existence of several works by Luis de Morales, who worked in Badajoz during the period 1550-1570. El Greco substantially modified Sebastiano's composition. In the latter, Christ is oppressed by the weight of the cross he carries on his shoulder. 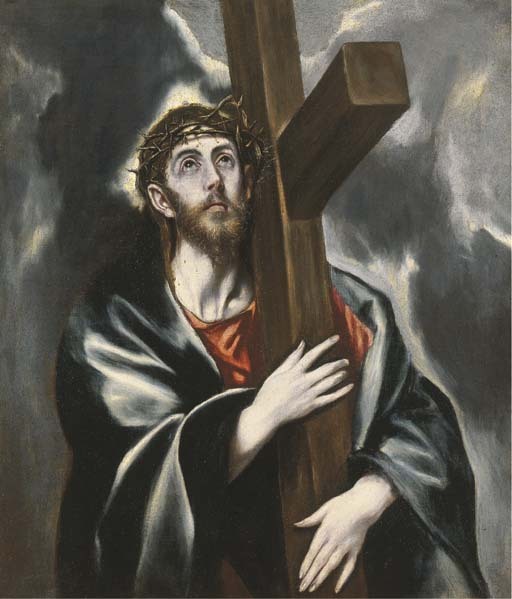 In El Greco's interpretation, he stands upright and gently embraces the cross with his eyes looking heavenward. Thus the cross is transformed from an instrument of martyrdom into a medium of salvation through sacrifice. Please note this painting is in a 17th Century Italian, carved, polychromed and gilded frame and is not included in the price of the painting. The frame is available for purchase. Please contact the Department for details.